Clear, practical advice on preventing and treating diarrhoeal diseases. Guidelines from medical authorities on diagnosis, treatment, symptoms, causes and risk factors, tests, training tips, feedback from the field, alternative medicine and much more for patients and health professionals. News on developments in the control, management, treatment and prevention of diarrhoeal diseases. the most important medical advance this century." 50 years ago, the first study showing that an oral solution of glucose and electrolytes was effective for replacing water and electrolyte losses in cholera was published in The Lancet. The 4·6 million annual deaths from diarrhoea in children younger than 5 years estimated in 1980 has fallen to under 500,000 in 2018, despite a 70% increase in the world's population. Although several factors contributed to this reduction, as of 2007 it was estimated that oral rehydration therapy (ORT) alone had prevented 54 million diarrhoeal deaths. Diarrheal disease is a major cause of death and illness. It claims the lives of roughly half a million children under five each year and causes millions more to be hospitalized. Diarrheal disease is particularly dangerous in poor communities and places where safe water, sanitation, and access to basic medical care may be limited or unavailable. advice on good practices to improve nutrition during the first 1000 days in your inbox daily. Rose George, The Big Necessity: The Unmentionable World of Human Waste and Why it Matters | TED Talk: Let's talk crap. Seriously. Stopping the loss of millions of young lives from pneumonia and diarrhoea is a goal within our grasp. The integrated Global Action Plan for the Prevention and Control of Pneumonia and Diarrhoea (GAPPD) proposes a cohesive approach to ending preventable pneumonia and diarrhoea deaths. It brings together critical services and interventions to create healthy environments, promotes practices known to protect children from disease and ensures that every child has access to proven and appropriate preventive and treatment measures. The goal is ambitious but achievable: to end preventable childhood deaths due to pneumonia and diarrhoea by 2025. Infants who are fed only breastmilk during the first 6 months seldom get diarrhoea. At six months, in addition to breastmilk, complementary foods with increased feeding frequency and changes in food consistency, quantity, and diversity as the child ages. Thousands of deaths could be averted through a combined prevention and treatment strategy — interventions such as improved mother and child nutrition, optimal breastfeeding practices; Oral Rehydration Therapy [ORT]; new low-osmolarity formulations of ORS; incorporating rotavirus vaccines; zinc supplementation during diarrhoea episodes; immunizing all children against measles; appropriate drug therapy; increased access to safe clean water and sanitation facilities and improved personal and domestic hygiene, including keeping food and water clean and washing hands before touching food. Families and communities are working together, with support from governments, states, corporations and non-governmental organizations, to prevent the conditions that cause diarrhoea and thereby rapidly reducing child mortality. by UNICEF.Learn about data visualization tools. Do you remember how your mom took care of you when you got sick? Moms everywhere want to take care of their kids. Diarrhea can be deadly, but mothers have hope when they have access to simple solutions. Proven, affordable tools should be at-hand for every mom, such as safe water and sanitation, oral rehydration therapy (ORT), zinc, nutrition, breastfeeding, and rotavirus vaccines. "Even though we have the knowledge and solutions in hand to defeat diarrheal disease, the issue can be a difficult, even taboo subject to discuss. That’s why we need to break the barriers and increase awareness." Integrated prevention and treatment solutions: child health, water and sanitation, nutrition, vaccines, zinc, and rehydration. 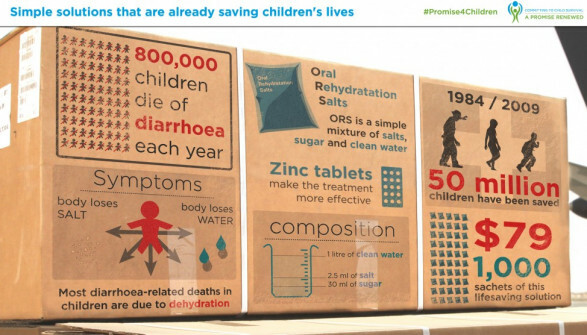 Help us spread the word about these solutions so no child has to die from diarrhea. Oral rehydration therapy and continued feeding is a life-saving treatment, which only 39 per cent of children with diarrhoea in developing countries receive. Limited data show little progress since 2000. Zinc tablets are still largely unavailable in most developing countries, although their effectiveness in reducing the severity and duration of diarrhoea episodes is well known. Immunization against rotavirus, which results in an estimated 40 per cent of hospital admissions due to diarrhoea among children under five, is urgently needed worldwide, especially in Africa and Asia. Safe water, adequate sanitation and proper hygiene are too often forgotten foundations of good health. Handwashing with soap alone could potentially reduce the number of diarrhoea cases by over 40 per cent. Breastfeeding is critical to both the prevention and treatment of diarrhoea. Infants who are exclusively breastfed for the first six months of life and continue to be breastfed until two years of age and beyond develop fewer infections and have less severe illnesses, including diarrhoea. Vitamin A supplementation has been shown to significantly reduce child deaths, mostly from diarrhoea and measles. Diarrhoeal disease is one of the greatest killers of children under the age of five. Using zinc supplements to treat diarrhoea, along with oral rehydration salts, not only helps children get better faster, it can even save their lives. Zinc - one of the more abundant elements on earth - has quickly emerged as an exciting new opportunity in the urgent quest to drastically reduce the number of global child deaths by the 2015 target for the Millennium Development Goals. When administered in conjunction with oral rehydration therapy (ORT), zinc has proven itself to be the most powerful tool to help children combat and recover from diarrhoeal disease. More than that, it has demonstrated important preventive power, helping children resist subsequent episodes of diarrhoea for up to three months, thereby reducing the number of episodes a child suffers each year and giving children more time to recuperate. In scientific terms, zinc supplementation in combination with ORT has been shown to reduce diarrhoeal incidence in children by an impressive 27%. Update: Some good news! The Lancet is reporting that diarrhoea deaths have dropped to around 1 million per year. This is promising news and hopefully these numbers will continue to decline as we treat more children who suffer from diarrhoea with zinc and ORS. The Global Health Media Project collaborated with award-winning animator Yoni Goodman to produce The Story of Cholera. Diarrhea kills more young children around the world than malaria, AIDS and TB combined. Yet a simple and inexpensive treatment can prevent many of those deaths. Why isn't it more widely used? In the West, it's an inconvenience, but, in the developing world, it can be a death sentence. It kills millions of children every year, yet the treatment is a simple mixture of salt, sugar and water. So why isn't more being done to fight diarrhea? In this article, published in Time Magazine in October 2006, the author Andrea Gerlin, investigates the reasons why diarrhoea still kills 1.9 million children every year, and why Oral Rehydration Solution is not more widely used throughout the world. Initiating breast feeding within the first hour and exclusive breastfeeding can prevent under two mortality. We believe all mothers know how to feed their child. But do they? Role of media in promoting proper young child feeding: Media should focus on and promote measures that are required to be taken urgently to ensure the survival of children	 Download .pdf 17.5 mb. The fight against persistent underweight, stunting and wasting among children in developing countries is based on appropriate maternal, infant and young child feeding practices including micronutrient deficiencies prevention and control. However, wasted children are those at immediate risk of dying and will need timely detection and correct management for their survival. More than half of all child deaths are associated with malnutrition, which weakens the body's resistance to illness. Poor diet, frequent illness, and inadequate or inattentive care of young children can lead to malnutrition. Of the 6.6 million deaths among children aged 28 days to five years: 1.7 million (26%) are caused by diarrhoea. 1 million (61%) of these deaths are due to the presence of undernutrition. Diarrhoea is the second leading cause of death among children under five globally. Nearly one in five child deaths – about 1.5 million each year – is due to diarrhoea. It kills more young children than AIDS, malaria and measles combined. Today, only 39 per cent of children with diarrhoea in developing countries receive the recommended treatment, and limited trend data suggest that there has been little progress since 2000. The handbook, Facts for Life , provides vital messages and information for mothers, fathers, other family members and caregivers and communities to use in changing behaviours and practices that can save and protect the lives of children and help them grow and develop to their full potential. Waterborne diseases (the consequence of a combination of lack of clean water supply and inadequate sanitation) cost the Indian economy 73 million working days a year. Some of the more commonly asked questions about Diarrhoea, Dehydration, Oral Rehydration Salts - Home Prepared and Packets, and Oral Rehydration Therapy.